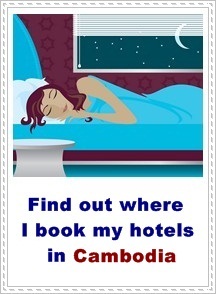 Looking for a room in Phnom Penh? The tourist street in Phnom Penh called "Golden Mile", close to Independent Monument is where most backpackers stay these days. I'm afraid that the previous backpacker area in Boeng Kak doesn't host a lot of guesthouses due to the redevelopment in Boeng Kak. If you just want a cheap place to crash in Phnom Penh, you have to try other places in Phnom Penh, especially for guesthouses near the Sisowath Quay. The guesthouses and hotels on Sisowath Quay are generally comfier and nicer, but of course pricier. Boeng Kak used to be the backpacker area in Phnom Penh. As of February 2012, most of the famous backpacker area in Boeng Kak has been 'closed'. They filled the Boeng Kak lake to build luxury apartments and shops. Villagers have been evicted, and the remaining inhabitants are still fighting against the developer system. So, most of the guesthouses in Boeng Kak area have closed. There are a few guesthouses left, like Grand View Guesthouse. Before the redevelopment Boeng Kak was a thriving backpacker area with action going on. And now, you don't even have a lake. Conclusion: The reason why backpackers stayed in Boeng Kak is now gone. I can see why Top Banana is recommended by Lonely Planet. Top Banana is a backpacker hang-out AND a place to sleep! The cheapest rooms cost $6 and has got everything a backpacker needs - bed, fan, attached bathroom and western toilet. The place is very popular because of the laid-back atmosphere on the balcony (it feels more like a lounge). You can either relax and read a book while laying in a hammock, take a nap in one of their couches or just to get to know other travelers. It's packed! After traveling in Cambodia for quite some time, staying at a budget hotel was awfully relaxing! Our room (407) had air-con that worked OK, private bathroom with hot water, free coffee, TV, fridge and it was clean enough. Their bed was comfortable and I remember waking up fresh and all good. Yes, given its price and location, it was worth the money. If you want a little luxurious Phnom Penh accommodation and want to stay by the river, you might check out the Riverside Hotel. The rooms are large and clean, with TV, hot water and Western toilet. Best of all, the rooms have big windows and present a nice view of the harbour. But when it comes to their service - the staff though could have smiled more and they weren't attentive. I wanted to ask them about the transportation options to Siem Reap. There were three of them working behind the desk, and there were no other guests at the reception. One lady was busy writing, and the two others were just talking. I waited half a minute, then I cleared my throat to make a signal that I was standing there. ... But they didn't pay any attention. Not even a: "Just one minute, I will come to you as soon as I'm done." So I just stood there and felt like that they didn't see me (but I'm quite sure that they did)! I was just frustrated, went up to my room and checked out after one night. Here are some other suggestions on where to stay in Phnom Penh. They're highly rated at Tripadvisor.